Digging through my CD collection today I found a disk for Adobe Photoshop CS. I installed it on my Ubuntu Desktop (using WINE) and was surprised at how well it runs. I have been trying to train myself to use GIMP, but no matter how much I practice, GIMP is still cumbersome with some things, especially when dealing with text on images. Also, Photoshop has non-destructive Adjustment Layers. In college I took 4 different Photoshop courses, so it is all coming back to me as I play around, although it has been several years. Anyone else using an older Photoshop in linux? Hmmm. I've got an older version which throws an 'unsupported OS' error if you try to install it on anything later than Win98. I might give this a try. At least I can hack wine and tell it what OS I want it to report to applications. Like for the photo! PS is very good, but GIMP is my tool. Real men do pixel art. @Adam Robertson I do not really understand what Adjustment Layers in PS is, seems to be a transparent layer on top of a stack of layers or a layer group of some kind? Care to explain? Adjustment Layers are layers that can be used to edit the appearance of all layers stacked below, without actually editing those layers, meaning an Adjustment Layer can be removed at any point and the layers below will appear as before. 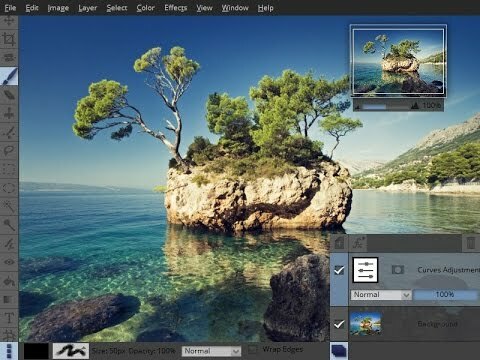 Faking GIMP Adjustment Layers may be for you? For those who do not know GIMP 2.8's layer and text options, here are some pointers. and some for Text too, but I do not know if it meets your requirements. @Haakon Meland Eriksen (Parlementum) Adjustment layers basically let you add a layer that is, for example, just Levels setting. The layer can be adjusted at any time and only affects the layers underneath it...which means you can have adjustment layers stacked, with masking on each one for specific areas of an image. In all fairness: Gimp has editable Adjustment Layers on their Roadmap for version 3, as well as better text editing tools, so I have not cast Gimp aside...but for now it is nice to have the ease of using Photoshop. It costs $35.00, but I would be willing to pay that if it does everything it says on the tin. I use Corel Aftershot, they have a Linux version. I tried the Linux version once, it's ok. I use Corel because of my workflow speed. I typically have a few thousand photos to go through at a time, so workflow is a big deal. For some reason I could never get anywhere with photoshop or lightroom, but i've watched people do amazing things with it. I do like Raw Therapee on Linux/FreeBSD, it's free/open source. I use GIMP for some things but it's awkward for me and seems missing alot. Will be great to see some new features coming soon. Did someone try darktable (lightroom alternative)? Opinions? digiKam logo digiKam is a Photo Management Application with support for Digital Cameras. Many years ago I was a Lightroom user, but when I finally got fed up with Apple and went full Linux I switched to Darktable. I can't speak to their current parity, but I love it. It fits my workflow well, and while I don't take the camera out nearly as often as I used to, I typically have several hundred photos to go through when I do. Darktable, Lightroom, Aftershot and DigiKam are more of a photo-management with some editing, while Photoshop and Gimp and Pixeluvo are designed for intense editing and design. Of course, you all probably know that already but I wanted to point out the difference. I often need an editor for re-doing photos that are going on someone's website. I do not take tons of photos of my own so I just use the default photo manager that comes with Ubuntu...I think it is Shotwell...very basic.